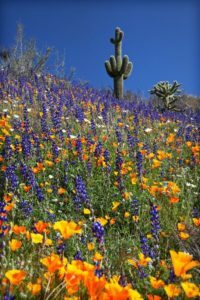 Spring in Arizona means three things…wildflowers, allergies and snakes. This past week our winter weather finally came to a close. After record rainfall and freezing temperatures (including snow!) we can finally break out our sleeveless tops and Bermuda shorts. Also top of mind is that we should have done more bicep curls and leg squats all winter, but that’s a topic for another day. With April we find that patios are once again used for wine sipping and lounging. Sounds great, right? After all, this glorious weather is what brought us to Arizona to begin with. But there are a lot of downsides to Spring in the desert. While I know I won’t get any sympathy from those friends in the Midwest who are still digging out from blizzards and dirty, melting snow, we desert rats have our challenges too. And it’s more than shoveling sunshine. 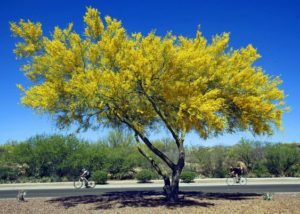 First, I have to say that the brightly colored flowers and blooming trees so ubiquitous this time of year are one of the true treasures of the Sonoran desert. Every cactus seems to have it’s own unique flower, each more spectacular than the next. The Palo Verde trees are a riot of yellow blooms that are gorgeous to view – from INSIDE the house. Because these lovely works of nature’s bounty bring with them allergies of gargantuan proportions. I don’t know anyone who isn’t using some sort of nasal spray or allergy tablet. Even those who have taken dramatic steps to curb allergies can be found with Kleenex stuffed in every pocket and eyes that stream from morning ’til night. The local Walgreens can barely keep the allergy meds in stock and our noses have begun to look like W.C. Fields on a bad day. The experts are telling us it will be a bad allergy season because the heavy rainfall has caused an abundance of blooms. From April until June we venture out of the house at our own risk…there is so much pollen in each tree now that on a windy day it can blow for several blocks. My second caution of the season is the annual awakening of the rattlesnakes. This was brought home to me last week when playing the second hole of our golf course. 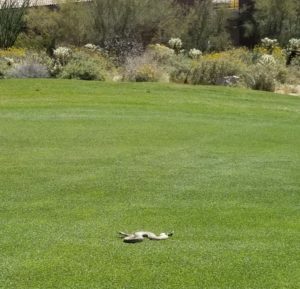 There, in the middle of the fairway, we came upon a huge rattlesnake. 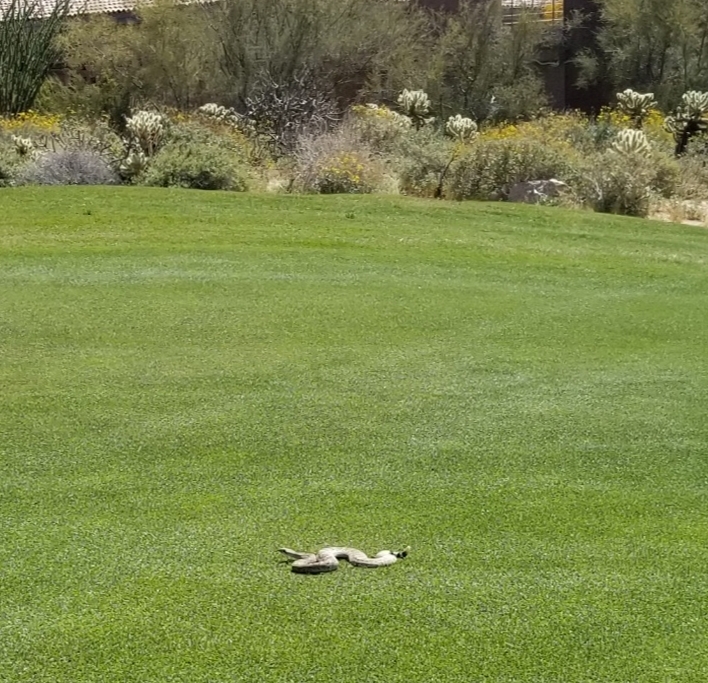 Usually they are resting comfortably under bushes or rocks but this guy was in the grass sunning himself, probably critiquing our golf swing. Our partners, who were looking into the distance and not at the ground, stopped right next to the snake. As we shouted for them to move the cart, the snake began to coil and hiss. Never a good sign. No one was hurt but it was a sure sign that these vipers of the desert are out and we need to be cautious. Their appearance is good news for the local golf stores as it means that no one with any common sense wanders into the brush to look for a lost ball. I lost two on Tuesday and as far as I’m concerned the snakes can have them. Rattlesnakes are scary, that’s for sure. But Spring also brings our big golf tournaments and another snake in the grass – the Sandbagger. So between pollen, snakes and cheaters, I’m glad I have some indoor hobbies to keep me occupied. The good news is the pollen dries up and the winter visitors with their bogus handicaps go away in June. The bad news? Living here will be equivalent to being in a microwave oven. You can’t have everything.